In 2003, the world started on its path towards a new way of socializing, communicating, and doing business. That's because on August 1, 2003, Myspace came into the world. Of course, Myspace was only a fad, but social media certainly was not. Now, social media is changing the way restaurants do business and interact with their customers. Cameron Olshansky gives insightful restaurant social media tips in this edition of theTop 5. 2004 introduced Facebook from a room at Harvard University. 2006 gave us Twitter, tweets, and trending topics. 2010 saw the launch of Instagram, filters, and #NoFilters. 2011 was the advent of Snapchat, geotags, and eventually the 24-hour long "Story." It's been less than 15 years, but social media sites like Facebook, Twitter, Instagram, and Snapchat have totally revolutionized the way restaurants interact with their guests, promote their brand, advertise, and even handle customer comments. To the restaurateur who didn't grow up with a computer in their bedroom and a cell phone in their pocket, the very idea of social media being an essential part of managing a restaurant can be confusing. Throwing around terms like hashtag, story, image filter, profile picture, trending topics, tweets, feed, timeline, and status update can make you just want to give up entirely. Not only is social media management for your restaurant essential, it's totally doable, and it can actually be pretty fun! Let's take a look at five tips for executing the perfect social media strategy for your restaurant. You can't expect to be noticed on social media without engaging visual content. Your visuals can be of anything that may interest or excite your customers - pictures of your food, your team, and your customers, or even behind-the-scenes videos of your chefs in action. It's well-known that a picture's worth a thousand words, and that people tend to buy with their eyes. The same is true on social media. Users of these social sites will "buy" into your site and your brand if you show them something, not just tell them. Take a look at this picture from Upper Crust Pizza's Instagram below. In the wake of the Pokémon GO phase, they posted a picture of a Poké Ball pizza on Instagram! Now that's clever marketing for the 75% of social media users who choose a restaurant after looking at images of food on social media. When your customers go to your social media page, a post from last week shouldn't be the first thing they see. Timely posts, like your special for the night, photos from a recent event, or announcing a limited-time discount just for your followers are smart ways to sell immediacy. After all, how would you feel if you went on a restaurant’s social media page, saw a 20% off coupon code, but found out it expired last week? Social media is a place for your customers to talk to you, and to talk about you. Make sure you're consistently checking these sites for mentions and comments, and reply to every single one of them. Getting a conversation started breaks down any perceived barriers between your restaurant and your customers, and will lead to more interactions in the future. In this example, Dunkin Donuts provides an individualized and signed response to customer praise with their signature "DD" and a plug to their seasonal Pumpkin Swirl offering. Now let's be clear - there is such a thing as too much posting. If one of your Twitter followers checks their timeline and sees 8 tweets in a row from you every time they log on, they may be a bit overwhelmed and decide to unfollow - and that's not a good thing! But the "less is more" mentality doesn't always apply to social media. Make sure you're posting at least 2-3 times a day on Twitter and Facebook and 4-5 times a week on Instagram for ideal exposure and engagement rates. Any less than that, and you risk not being noticed. If you have a great picture to share or are announcing the biggest sale of your year, this obviously should be spread across all of your restaurant's social media sites. But recognize that some content is better for certain sites than others. For example, cropped and filtered images work best on Instagram, and you wouldn't necessarily ask someone to comment on your 140-character Twitter post - you'd ask for a like, retweet, or reply. Copying and pasting the exact same message across all of your channels will limit your words and creativity for each site. Take Paris Creperie, for example. 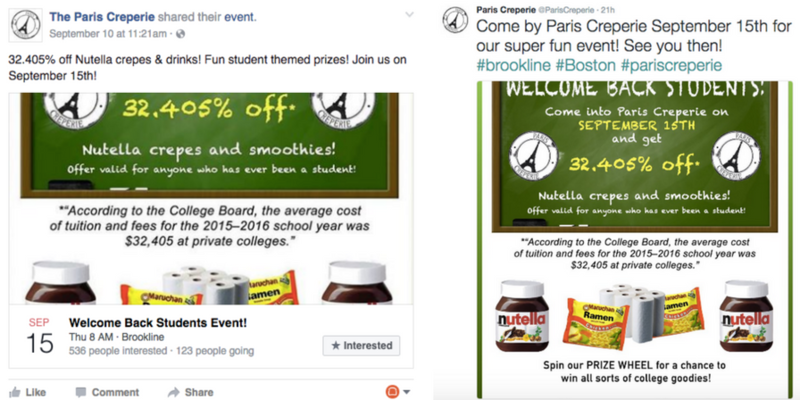 For their back-to-school special, they alerted their fans on Facebook (left) with an event for the near future ("Join us on September 15th!") and notified their followers on Twitter (right) with hashtags and immediacy ("See you then!") to increase exposure. Same message - different strategy! If the whole concept of social media is still a bit fuzzy for you - don't worry. You're not alone. That's why we wrote this restaurant online branding guide Social Media For Restaurants: How to Manage Your Brand Online. It's chock-full of social media tips for your restaurant and the perfect posting strategies for Facebook, Twitter, Snapchat, and Instagram. Plus, you'll see some all-star examples from businesses that are owning their social media presence. The guide is free and exclusively for restaurants! In this exclusive guide, we explain that the nature of social media is immediate - so there's no time to waste! Download your free copy of Social Media For Restaurants: How to Manage Your Brand Online below!